Win a Meet & Greet with Larry David! A MASSIVE opportunity for serious fans here! 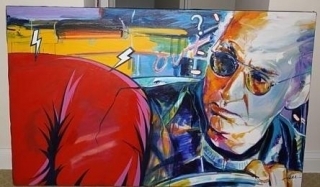 The Max Cure Foundation is auctioning off an opportunity to to own a signed Larry David Oil Painting AND attend a meet & greet with Larry on the set of Curb Your Enthusiasm in Los Angeles. The Max Cure Foundation, medications is a non-profit corporation that supports causes focused on pediatric cancer treatments and improving the lifestyle of children afflicted by cancer. For more information about their work visit their website. To bid on this once-in-a-lifetime chance, symptoms visit their eBay store. Your chance to star alongside Larry! Posted on August 19, 2009 by Alex. This entry was posted in Curb Your Enthusiasm, News and tagged auction, charity, max cure foundation, meet larry david. Bookmark the permalink. Season 7 Season 7 Season 7! I have no money, but I do have humor and will donate stories, which are true and can be exaggerated from funny to halarious. Thats what Larry would do!! The advertisement is all wrong here. This is not “a chance to win” a meet and greet this is a chance to buy a meet and greet. Got all excited for nothing. I see its for a charity but come on call it like it is. Larry, your sense of humor makes me smile from ear to ear. My kids watch your DVD, curb your enthusiasm and can’t stop laughing. It’s the only good writing worth watching. I would love to meet a man like you someday to be my best friend for life. Your the real deal! I would pay to get a picture with Larry David . I would pay for a walk on roll meet and greet package. Oy i’d love to meet Larry David. We could get into an argument. People are such pansies about picking fights. i want a real fight about something stuipd meet me. i have no sense of humor. i’m grumpy and feel sorry for myself. if there t’whatever was a person who needed a Larry David to merciless pick on her, that she’d be me. so bring it! I cannot afford to buy a meeting with Larry David, however, I would love the chance to meet him in person. I Love curb & I can relate to him on so many levels… Too bad the average commoner like myself cannot get such a chance. I think he should travel the country to meet fans, now that would really be awesome!! !